Abide Brewing | Home | Local.Craft.Ales. Abide Brewing Company is proud to be the first brewery in Newnan, Georgia. Local residents Matthew Kapusta, Evan Scanlan, and Philip Leonard developed their craft while home brewing. Together in 2013 they decided to follow their dreams and start a local nano-brewery that focused primarily on quality, flavor, and the unique techniques of brewing. 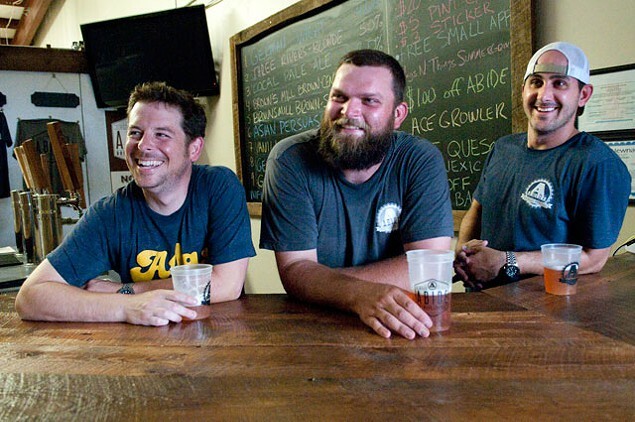 Their desire is for the community to “accept without objection” Local Craft Ales. Serving draft beer in Coweta, Fayette, Troup, Heard, Harris, and Meriwether Counties since February 2015 . Don’t see us on tap? Ask for it and let us know! Cheers! NOW SERVING IN : Muscogee, Talbot, Chattahoochee, and Marion Counties! Watch our Facebook page for regular updates on locations.